Things are getting difficult all around these days. For many people, money is already tight and the prices of everything seem to be steadily climbing. It can seem that there isn’t extra money to put towards preparing, but I would challenge you to really think about your spending habits. Can you forego the packs of gum, snacks at the Zippy Mart, and fast food lunches? None of those things leave you with anything of value later. If you can set aside what you normally spend on things like that, you could probably find another $10 a week to put towards preparedness items. I would advise beefing up your stockpile of non-perishable food as a primary goal. Beyond that, keep an eye out for the bargain items in the clearance aisle and the basic equipment that can help you later. While out running errands in Wal-Mart and Tractor Supply Company today, I took a few moments to snap some pictures of things I would consider useful and reasonably priced. Forgive the quality of the photos- they were taken with my phone- but maybe they will give you some ideas. Typically, I would say get the very best quality items you can afford since they may have to last you a long time. If the choice is a cheaper one or none, I’d go with cheaper and hope to upgrade later. The cheaper items can always go in the Barter Larder. 1. Fishing Lures. Fish are a good source of protein. Not a bad price for a little all-in-one kit. 2. Fishing Pole. 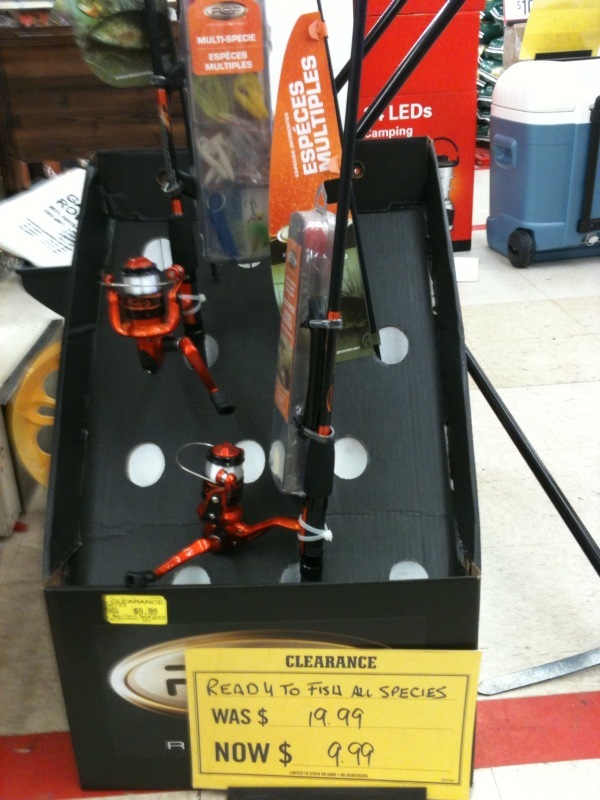 And here is a fishing pole to go along with them. 3. Pocketknife and Light Combo. 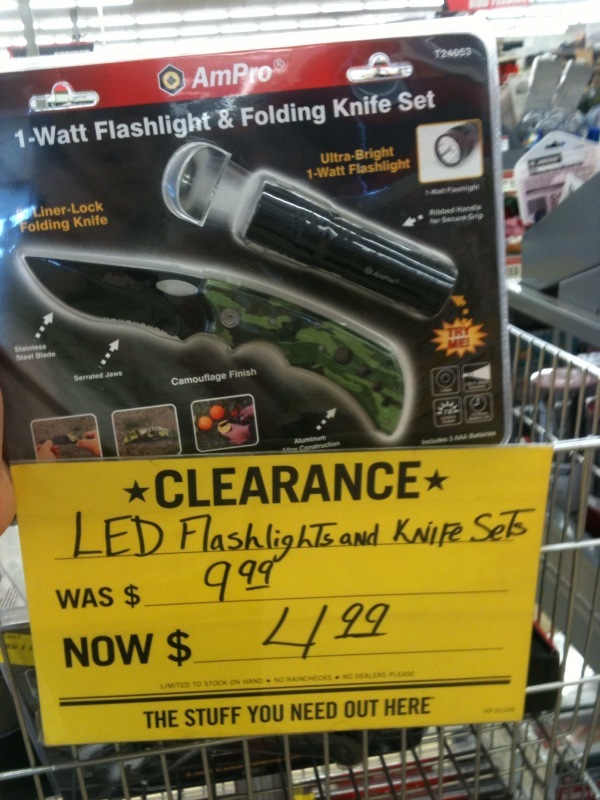 Hard to have too many LED flashlights or pocketknives. 4. Rain Poncho. 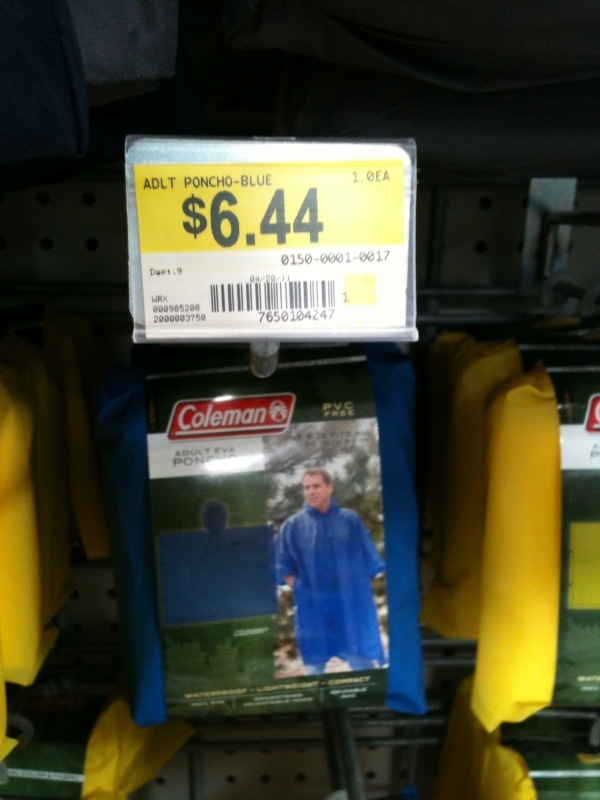 You can withstand a fair amount of bad weather and get by as long as you stay dry. 5. Magnesium block. 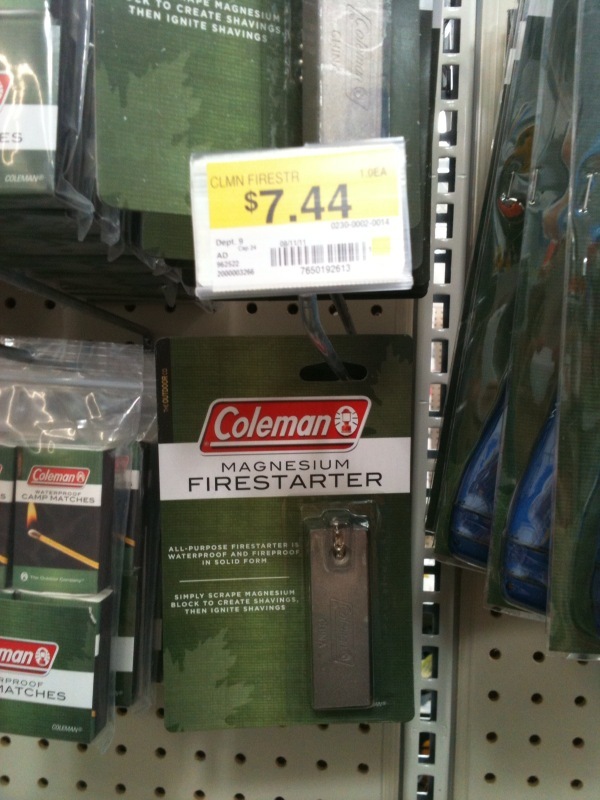 Better yet, get a magnesium block, use the back of your pocketknife to scrape off some shavings, and make a fire to stay warm (in your poncho). 6. Task Light. This cool little light has both a hook and a magnet on the back. There are 4 lights on the end and 24 across the panel. 7. 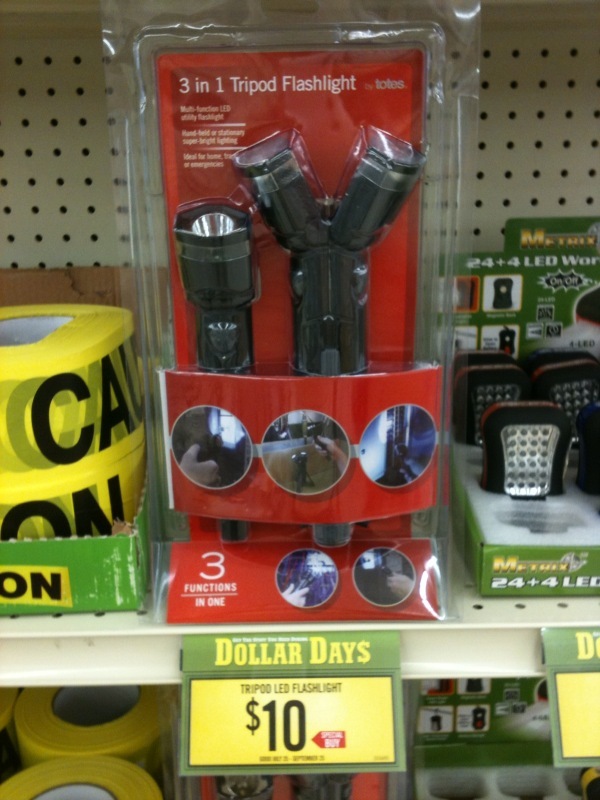 Multi-purpose light. Our son thought this LED flashlight would be particularly cool for hanging inside a tent so that the light would penetrate all areas rather than just one spot of light in the center. (Now that we’ve opened it, I can see that all 3 flashlights can be removed from the tripod base to be used individually too. Hanging it from the top of the tent would take a little Boy Scout ingenuity since there is not a hook). 8. Spare gloves. Not great quality heavy-duty gloves certainly, but if I had to change a tire or use jumper cables on a cold day, I’d be glad to have them. We used an old set of these yesterday to pick up fallen fruit to from a friend’s pear tree. They saved us some wasp stings. 9. Wound care. Animals get injuries and if I can avoid an expensive trip to the vet, I’ll give treating Fido at home a try. 10. Tried-and-true canning manual. You need one of these. Then save up for a good pressure canner. 11. Cast iron skillet. Okay, I cheated a little on this one. It’s a bit over $10, but I’d check the floorboard and cupholders for change to pick up one of these! 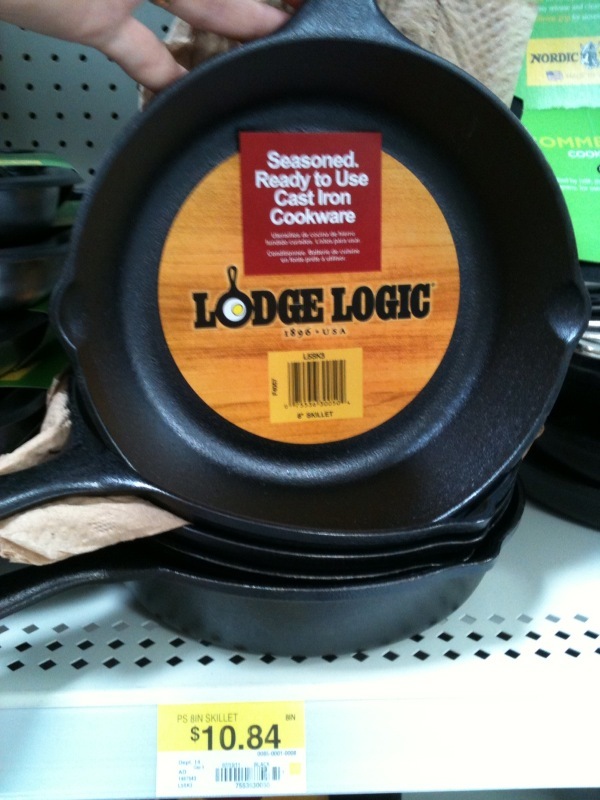 You need cast iron cookware and Lodge is a great brand. Have any other good ideas? Please post them in the comments section. This is a great posting. Thanks for the photos, 1 photo worth a thousand words. All good info. Thx. 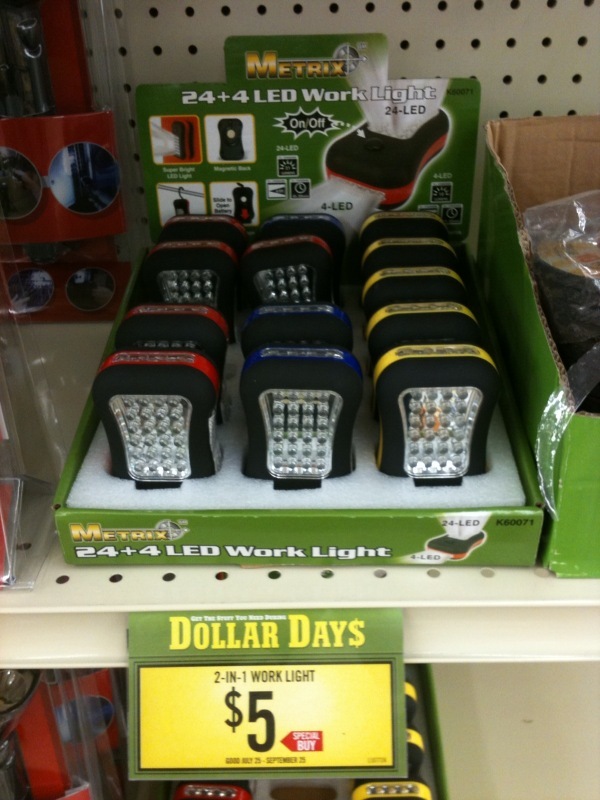 😉 Harbor Freight has a lot of good items that I find at better prices than some other places. Good place to check & they will send you monthly flyers if you sign up for it. 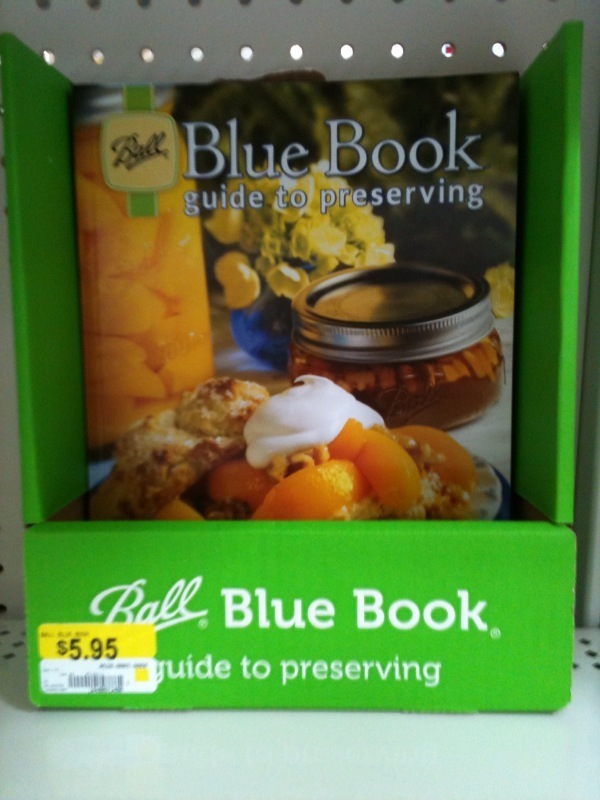 That Ball canning book is $2.00 less than I paid for the exact same book at the county Walmart. Dat ain’t rite! I wonder if it was an end-of-season price (though it didn’t say “rollback”). Or maybe it’s just because our store is so rinky-dink now. They remodeled last year- made big wide aisles- and now they carry half the stuff they used to and get less than half the business, too. For example, they no longer carry any real trash cans or large pet food caddies to put the previously mentioned mastiff puppy’s food in. (I picked up the bag and it poured out of a hole in the bottom that mice had chewed. Grrrr….). 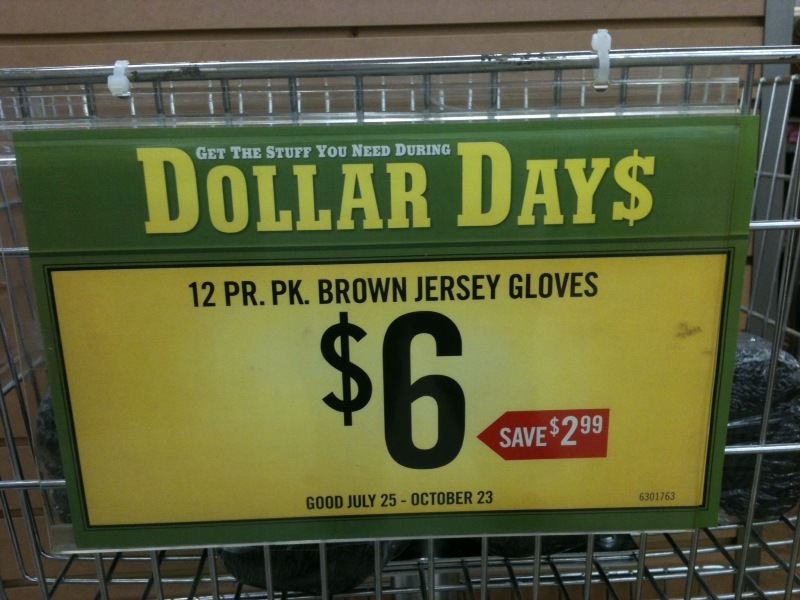 Anyway, possibly our store gets markdowns that mainstream ones don’t b/c they do so little business now. Literally, during back to school tax-free shopping, still the parking lot was less than half full. 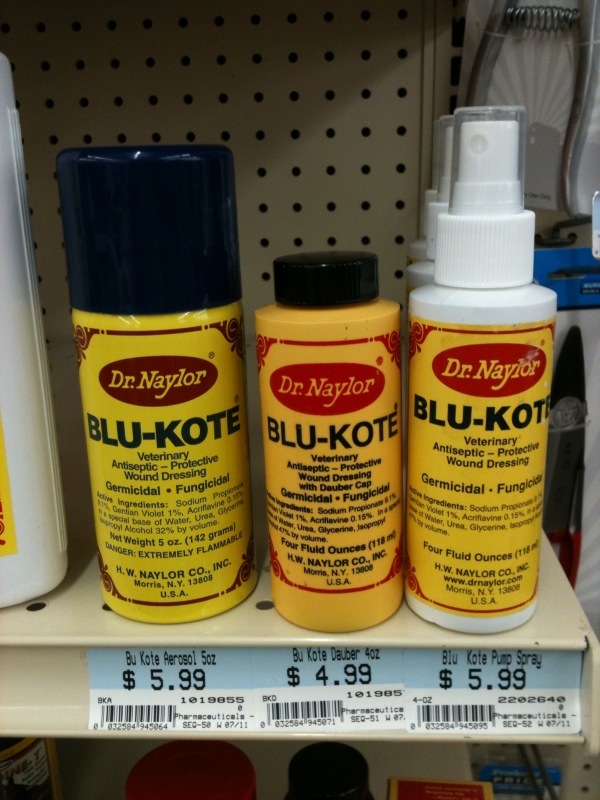 Great post… I think we forget how inexpensive it is to prep. I was going to do a post like this recently. Maybe I will do a “continuing” and reference your post. I appreciate the credit, but I’ve seen some similar types things elsewhere, so the idea wasn’t completely original to me either. I think I’ve even seen a couple sites with lists of what you could get for $5 (had things like coffee filters, WD-40, keychain flashlights, etc). If I remembered exactly where I saw them, I’d give credit. It’s been a while. I may do some more posts in the future since I love to see other people’s ideas of things I may not have considered. The point here is to help each other out. I’d love to see what you come up with. I found the site I was thinking of before with great lists of things you can get inexpensively. Fantastic site, too! I’m feeling some irony about this post. Right after I had mentioned above that I’d try to avoid a trip to the vet if possible, the puppy’s whole face swelled up. He could barely open his eyes and he was hardly recognizable. He was crying miserably. I called the vet and they confirmed that I should give him a Benadryl, but then speed him over there just in case. A lady in the office waiting area said, “What a cute Shar pei!” I said thanks, but that he is a Mastiff, so he shouldn’t look like that. Two big shots (and $60) later, he looks a little more like himself. He was probably stung by something but the vet said we got him there in time so he should be alright soon. We stared prepping just a little while ago. At first I bought a few extra items every time I went shopping. But soon we noticed that with the money being so tight we would not get very far. 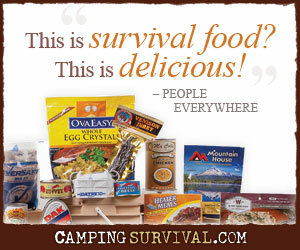 I found this great company that has helped me to make money and get free and 1/2 price long term food storage. Check out http://www.srcareers.com if you are serious about prepping and puting food by. It’s been a God-sent to our family.